Today I’m continuing in an irregular series of posts about my new book — both in the hopes that these’ll be interesting posts and also, obviously, in the hope that maybe as I delve into it, it might intrigue you to actually buy the book (and then hopefully write about it yourself, either by posting a review on Amazon, or on a message board, or your own blog or website/webzine). One thing I’m going to do is refer to my book as M*sques and C*pes: An Imaginary History — with the “*” representing an “a” and the “and” standing in for “&.” Why? Because I don’t want to glut the search engines with my posts talking about my book — since, as mentioned, I’m hoping (eventually) other reviews and posts might crop up about it. One thing I’ve discovered as someone who has posted a lot on-line (and written a lot of pieces for Huffington Post Canada, for instance) is that if I google my name (narcissistically) to see if anyone is responding to or referencing something I wrote in their own blogs or message threads — that what mostly comes up on the first few pages are simply things I wrote, sporting my by-line. Although, equally, part of the point of writing this blog is to promote my book (including if someone googles it) — so I’ll do it once: Masques & Capes: An Imaginary History by D.K. Latta. There! I’ve done it! (And for a webpage specifically devoted to it, including with links to where to buy it, go here — though equally you can just go to Amazon (.com or .ca or .whatever) or Createspace and find it there). M*sques and C*pes is a collection of all-original prose superhero stories. Part of the gimmick was to imagine a decades-spanning Canadian comic book publisher ala Marvel Comics or DC Comics — something that has never existed in Canada. And I think it’s fairly unique. Aspects of my book have been done before, of course. I’m not saying they haven’t. What I am saying is I’m not sure anyone has put these ideas all together. There have been the American Wild Card books (created by George R.R. Martin) — shared world anthologies where multiple authors have contributed tales about a world where people with super powers exist and at least the first volume deliberately placed the stories in different decades in America. There have been recent Canadian anthologies like Masked Mosaic: Canadian Super Stories and Tesseracts Nineteen: Superhero Universe in which various authors contributed tales (myself included) — both books available at bookstores, on-line and off. There have also been prose novel and story collections featuring established comic book heroes like Spider-Man, Batman, etc. Nor am I pretending I’ve read, or even heard of, every example or contribution to the particular sub-genre of prose superhero fiction (though I’ve read quite a few). So why am I saying my book is “different?” Why am I saying it’s a book I’d like to have read if somebody had written it first? I decided to imagine a Canadian superhero universe — basically, asking “what if…?” there had been a Canadian publisher like Marvel or DC? Y’know, a comic book publisher that had begun at the beginning of the genre (late 1930s/early 1940s) and continued on until today? Because that’s something Canada has never had! Canadian comic book publishers have generally been short-lived and focused on limited titles. I think the actual number of post-WW II Canadian (superhero) comics probably numbers less than fifty — not fifty titles, I mean literally fifty issues (do the math: the original Captain Canuck ran 14 issues, Northguard 8, Orb 2 or 3, etc…). Even throwing in the American Alpha Flight and we’re still probably looking at less than 200 issues — whereas a single character like, say, Spider-Man has probably accounted for over three thousand comics in the same period! So I thought it would be fun to imagine a decades-spanning pantheon of heroes. The stories themselves are mostly self-contained, set years apart, most featuring characters unique to that tale — but nonetheless set in the same continuity. As part of this concept, each of the stories is credited as though originating in some old comic (Terrific Tundra Tales #8, Leaf Girl #11, etc.). So, in a way, the stories are meant to be plays within plays, read with the awareness of them being comic book tales. Except…then I mess with ya. Though the book is mainly a PG-rated affair, there are talks about social issues and even one or two post-coital conversations! Not something you were ever likely to see in an old comic. So you could view these as the “true” exploits that inspired the comic book adventures. And that’s not without precedent. I remember old Marvel Comics where the characters would sometimes refer to their own comic books (maybe complimenting how an artist captured their likeness, or complaining they got the tale wrong — very head-trippy and metatextual). Some of the stories I wrote are meant to reflect different eras — both historically (The Cold War, hippies, etc.) and also the comic book eras (usually identified as The Golden Age, The Silver Age, etc.). Some stories lean more one way, others more the other, but it’s part of the theme of trying to imagine a decades-spanning comic book universe. In that vein, some of the superheroes are deliberately meant to evoke established archetypes — while others are fairly unique. And sometimes the periods (either the real decade, or the comic book era) are pivotal to a plot, other times it’s just acknowledged by a passing reference to a pop song or a politician. The Canadian aspect was also crucial. I mean, that was part of the point: to imagine a major Canadian comic book publisher like Marvel or DC and to posit the kind of tales — and perspective — that such a company might have brought to the genre. The whole “Canadian identity” thing has kind of been my pet cause for decades. 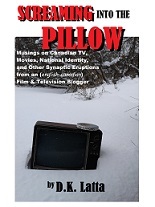 As someone who has written, inparticular, about Canadian film and TV extensively, a recurring beef with me is how many Canadian storytellers hide their Canadianness, or even when they acknowledge the setting is Canadian, characters conspicuously don’t use Canadian terms or expressions, nor refer to Canadian places or events, the creators sometimes labelling these things as “Anytown, North America” or “Generica.” And this alternately annoys me — and bores the Bejeezus out of me. To me setting is part of storytelling, and can be used to enrich and enhance the tale, suggesting plot twists or character nuances that wouldn’t arise if the story was just the millionth generic story about a cop in Los Angeles or wherever. Canada is just as good a place for stories — even pulp adventure stories about superheroes — as anywhere else. At least — that’s what I’m trying to prove with this collection. Not just by acknowledging the Canadian setting, but seeing how that influences the plots (such as a story during the Cold War told from the perspective of a middle power country). So, yeah — there’s a bit of a mission fuelling this book. However…that doesn’t mean the Canadian aspect is always front and centre. Indeed the book is constantly being torn in multiple directions, serving different masters — the comic book idiom and the Canadian identity thing (as well as just being, hopefully, entertaining page turners). Are these mostly superhero stories that just happen to be set in Canada — or are these Canadian stories filtered through the superhero milieu? Answer: both and neither. But what it means is I wasn’t hiding from the Canadian setting. I simply accepted it and then saw what emerged from that acceptance. In the same way that many American and British stories draw upon their settings in ways that can border on subliminal — but that Canadian storytellers are often discouraged from doing (many a Canadian writer/filmmaker/songwriter/etc. has bragged — literally bragged — that you can’t tell their work is set in Canada). So in some stories the Canadian milieu might fuel the plot — in others it’s barely even alluded to. It just depended on what the tale needed. With that said, I did deliberately create a lot of superheroes with distinctly Canadian monikers — but that was part of the game. To embrace the Canadianness — and see what emerged from that. Honestly? I think there are some pretty cool characters in this collection. Another aspect that might be controversial is that I didn’t avoid letting the stories occasionally slide into socio-political areas — either literally, or as allegories. To me storytelling is partly about dealing with the real world — even if in a blatantly fantasy form of super beings in garish costumes. To me some of the best fantasy — from Star Trek to, yes, superhero comics — are ones that are willing to get their hands dirty grappling with issues. If you’ve actually read actual superhero comics — little in these stories should surprise you. But if your idea of superhero adventures remains the Super Friends or something than, yeah, you might be nonplussed at times. That doesn’t mean the stories are “preachy,” per se — they are first and foremost meant to be entertaining escapism. But the heroes are, in their way, meant to be real flesh and blood characters — and real flesh and blood characters sometimes grapple with real dilemmas. But what I would argue makes this collection most different from many other superhero prose story anthologies (at least those I’ve read) — is that the stories are meant to be superhero stories; mystery-detective tales, action-adventure romps (while also touching on character and social issues). They’re trying to capture in prose what you’d expect to read in a comic book or see on the big screen. As part of the “game” of imagining a comic book line, I wanted the stories to feel like they really were individual adventures in a much vaster canon of stories. A lot of prose superhero collections often eschew that, preferring to be ironic, or deconstructivist. Which is fine — there have been some great stories like that. But I’m also not sure why there’s a type of superhero story you expect to see in a comic/TV show/movie — and a different type in prose. I’ve read more than one superhero prose anthology and just longed for a few stories in it in which a hero solving a crime, or saving the day, actually was central to the plot. After all, the impetus for this book was to make the case for a Canadian superhero universe, to argue that there could have been a major comic book company churning out just these sort of adventures for decades. That doesn’t mean some of the stories aren’t introspective or ironic or deconstructivist — or tongue-in-cheek. Some are! But equally they are meant to be read and enjoyed as exciting thrillers and pulpy adventures — set against an unaplogetically Canadian backdrop. I enjoyed writing it. Hopefully you’ll give it a try and enjoy reading it. So check back here from time to time, won’t ya? (Or better yet — just buy the darn book and form your own opinion and write or blog about it — for good or ill).